Take one Rich MSM Torpedo tablet twice daily per 60 pounds of body weight to start. For best results take with half as much Vitamin C. Increase until you feel the difference. Take with meals or your favorite juice. For optimum results, use in conjunction with a diet high in fresh fruits and vegetables. MSM is one of the foundational building blocks of a health body. If our body doesn't receive the proper nutrition and the building materials it needs, it will produce bad, dysfunctional cells, deficient of the basic ingredients that constitute a healthy cell. This is not difficult to understand. If you've ever had a canker sore it's because you lack something in your diet, possibly vitamin A or C. Your body tries to heal itself, but with deficient materials it draws from other resources, and it usually takes what it needs from the inside skin of our mouths leaving a sore on the inside of the mouth. If we give the body what it needs to heal itself, it will repair the sore in the mouth and the skin will become healthy again. If we want a good flexible cell, capable of maintaining good health, we need to supplement our diets with MSM, to enable the body to heal itself. MSM is a natural part of every cell function and is concentrated in the connective tissues of the skin, nails, and hair. MSM is a source of organic sulfur and is a key nutrient for its diverse health benefits. Through MSM is found in many fresh foods, modern agricultural methods and food processing cause its depletion. This makes it difficult to get adequate amounts of MSM in the daily diet. 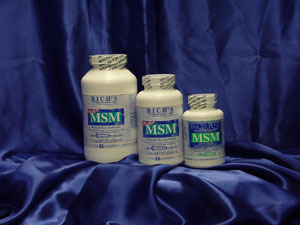 Rich's MSM helps restore the body balance with a needed natural source of sulfur for support.